A quick update on what the stars are saying in 140 characters. Abhishek Bachchan: Going to greece for shooting. My new movie GAME! Great co-stars. Looking forward to it. Thankfully the mrs. Has agreed to come along. Priyanka Chopra: then tom I'm off to coorg for two months for saat khoon maaf!! Very excited for the film but will miss home so much!!! Preity Zinta: "All villians BEWARE as there is a new Lt. Colonel in d family ! I am so excited & cannot stop grinning as i used to beat him up ;-) Ting ! Thanx 4 all ur wishes 4 my brother! Very proud of him & a little emotional as dad was also a Lt. colonel. He would be so proud of him 2 !" 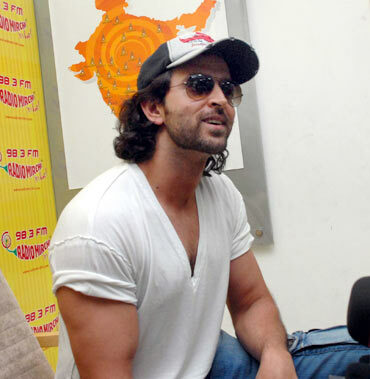 Hrithik Roshan: "Felt like dancing! Hype is the coolest club! Loud music, friends jumping, enjoying life! Yeeeeeeaaaaah!" Sandhya Mridul: "Amazing amount of Freedom in this city..freedom for cops to jump lights, tempo's to park mid road and load goods & of course Jaywalking!" Hrithik his wife Suzanne and Kites co-star Barbara Mori: Enroute to Maldives -- Whoever said three's a crowd? Shah Rukh Khan -- doing what he does best -- running onscreen! Sameera Reddy with her parents -- love the natural smiles!